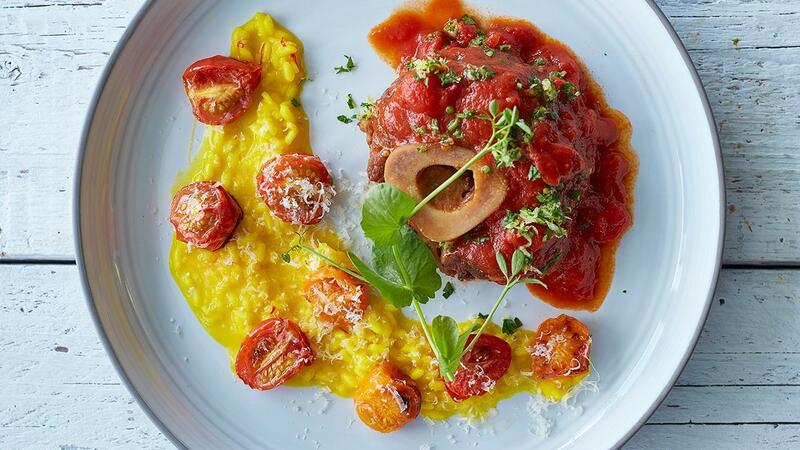 This Osso Bucco with risotto Milanese, is a classic Italian staple. Add Tomato Pronto and Knorr Demi-Glace. Put the sauce together with shanks and vacuum in a vacuum bag. Prepare sous-vide for 6 hours on 85 degrees Celsius. Fry the chopped shallots in olive oil without coloring. Add the rice and fry it gently for 2 minutes. Add the vegetable bouillon in small steps. When the bouillon is soaked into the rice and the rice is “all dente” add the butter and the parmesan cheese.